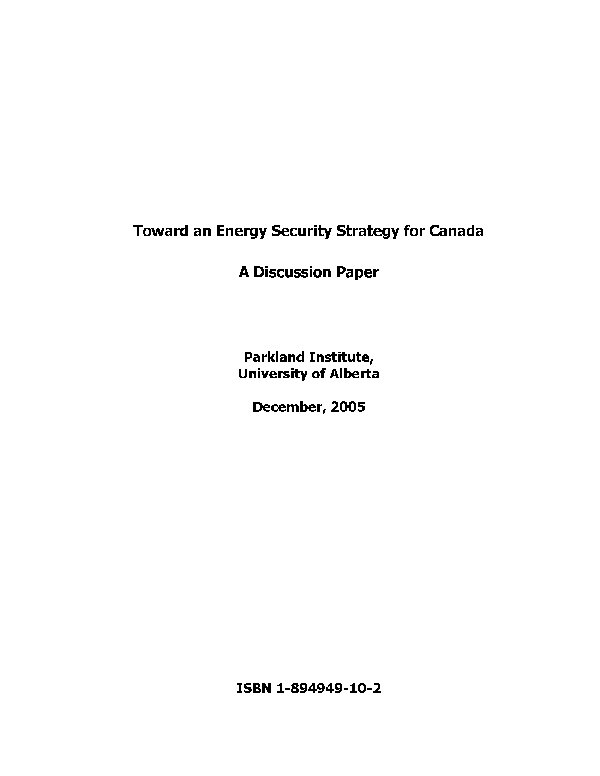 This paper is aimed at promoting discussion on the development of an energy security strategy. It is a made-in-Alberta initiative, in partnership with Canadians from energy producing and energy consuming regions. In October 2005, the University of Alberta’s Parkland Institute hosted an energy visioning session in Calgary, which was attended by individuals and representatives of organizations from across Canada. Many of the ideas informing this Paper were discussed at the Calgary session, and Parkland has also received significant input since then. This paper is intended to take the discussion to the next stage. It sets out the context for an energy security strategy, and then provides principles to guide it. The next stage of this project will expand on the principles, setting out specific policy proposals to ensure that Canada’s limited energy resources support the public interest and our distinct Canadian values.